At some point, when setting up a new website or business you need to give some thought to your telephone number. In the UK we have numbers that start with 08 which have different charging rates (free, local, national etc) and I've been asked several times in the past what's best -some people perceive having an 08xx number as being more professional and easier to remember. There are cases when an 08xx number is a good idea but generally if you're running a local business, I would use a local number i.e. one that starts with 01 or 02 (not 03 -I'll explain why later). Why 01xx/02xx over 08xx? 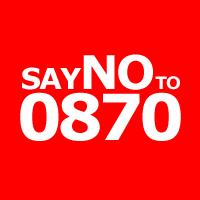 Simply put, many phone contracts (mobile and landline) don't include 08xx numbers in their "free" call plan and customers with those that do (there are a few) often aren't aware whether it's included or not. Adding any form of barrier to the customer contacting you has to be a no-no. 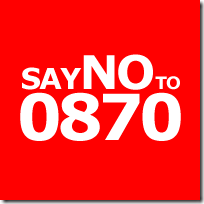 Don't forget people object to 08** numbers so much there's even a website dedicated to giving you alternatives to the 08** number - http://www.saynoto0870.com/. So why not 03 numbers as they're local numbers as well right? Yes they are but as with anything unusual, it acts as another barrier to people contacting your business.